Road: NW Corner of Baltimore Ave. and Ikea Center Blvd. Inscription: "We love you, Jerome! Gone but not forgotten. We miss you. 2/24/78 - 8/29/2004" in kidnap-style cutout writing on paper around photo of the victim. 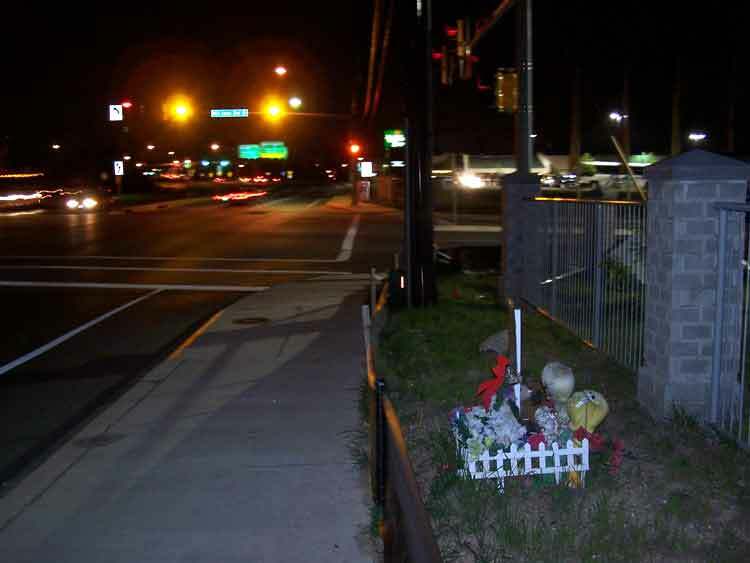 Description: This roadside memorial consists of a small green wooden cross surrounded by tons of fake flowers and stuffed animals. A poster board with the victim's photo and a message from friends hangs on the cross. The biggest stuffed animal: Tweety bird. All this is surrounded by a small white picket fence.